Myself and Chuck Elliot (SHU) wrote and produced the song ‘If I can’t dance (I won’t join your revolution’) - hear it on MP3 now. I have played in several bands (guitar, harp, sax). Just list key words and names here for search purposes. Circa 1967. The name is from a chemical reaction. Geekish, yes? Personnel: Mike Parr, Gareth Priestley, Dave Williams, Dave Rogers (Rodgers? ), John Sutcliffe. (Tony Mitchell joined later). Played around West Vale, Greetland, Halifax. 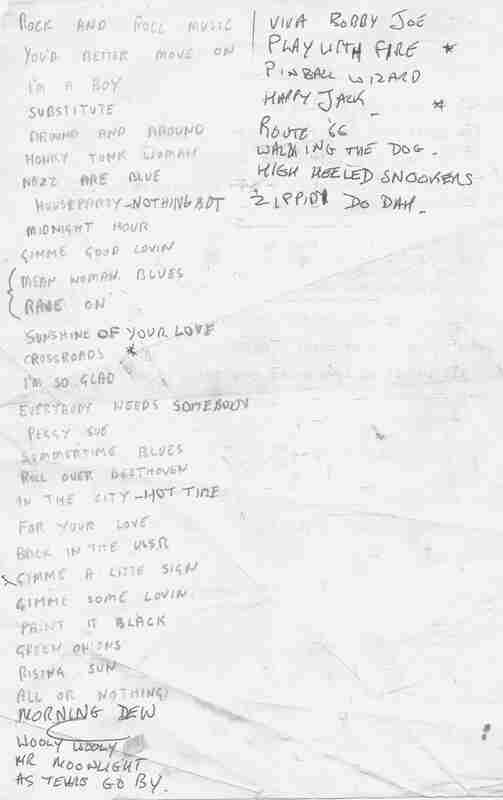 Here is a pdf image of a set list. How many bands have that name? We rehearsed near the road in nether Edge, Sheffield. Circa 1990. Personnel: Mike Parr, Caroline Dryden, Steve Morris, Steve Hawley, Mike Reed. Played around Sheffield. Personnel: Mike Parr, Caroline Dryden, Ian, Gary, Phil. (Guitar tech to Mike: Robert Johnson). Studio recordings in mp3: Danger Signs (own composition) , unnamed cover 1 , unnamed cover 2 . ... do open-mics, acoustic stuff. Recordings to follow. And on Blues Harmonica we bring in: Little Walter, Paul Jones (check out his early Manfred Mann stuff), Mark Feltham of 9 Below Zero etc, Sonny Boy Williamson.